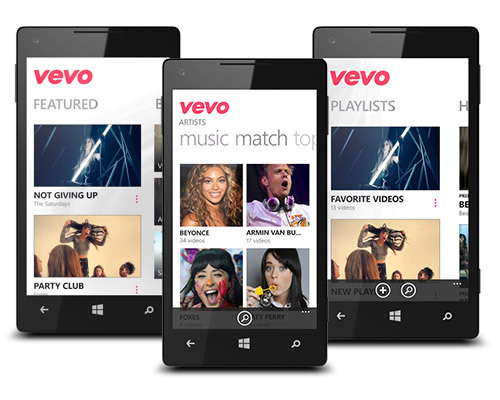 Music video service Vevo has announced an update to its Windows Phone app today. Other than getting a revamped user interface, the app now shows a new Home screen that features Vevo’s real-time video news feed, which displays music video premieres, new episodes of Vevo shows, recommended playlists and news on various artists. It is also easier to browse through content on the updated app — users can check the Featured tab to access the latest video premieres and recommended playlists, look through all the top artists on the Artists screen, or tap Videos and swipe to see Vevo’s library of live performances and top videos in every genre. And it has become easier to add videos to your favorite mixes either from the Home screen or while watching them in full-screen. What’s more, Windows Phone users in the US and Canada can now get access to Vevo TV, which features curated music video channels. In Mexico and Germany, users get a custom channel of localized international content instead. Vevo says it is working on making Vevo TV available in more countries and adding more channels.